Pockets pose wonderful possibilities for riddling, creating and writing. Remember when you were a kid and you carried in your pocket a superball, a wrapped chunk of Trident, a quarter for the ice cream truck and a wilting clover? 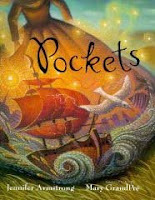 My kids and I have loved Jennifer Armstrong's book, a tale of how pockets changed the destiny of an entire village, with gorgeous illustrations by Mary GrandPre. Even if you've outgrown the habit of carrying things in your pockets, there are dozens of other trinket-holders that will serve. glove box, purse, wallet, junk drawer, briefcase. Make a list of all the objects therein. Now write a story with those objects guiding the way. In a group, pool all your objects and place them in the center of the table. See how many of them you can include in your story. Oh, and you can do this with pockets, too! I love this. I started a story about my aunt's pocketbook and the things I saw there when, as a child, she let me look in it for a piece of gum. I like the other angles you point out too. Great prompt. Now I just need to get on with it and finish my story!